After we stop taking math tests, most of us never face true temptation again as long as we live -- at least not temptation on the scale of a van full of Krispy Kreme donuts and an empty stomach. Thankfully, you'll probably never know how you'd react to a situation like that. But we know how one particular group of police would. This modern-day morality tale happened on Tuesday, when a van was reported stolen in Lake City, Florida. The Miami Herald reports that the van was recovered 200 miles away in Clearwater. The twist, however, is that it was a Krispy Kreme van filled with dozens upon dozens of donuts. Some might have torched the van and made off with the loot, but not a group of police officers from the coastal city. It's unclear what the thief's original motivation was for stealing a Krispy Kreme van. 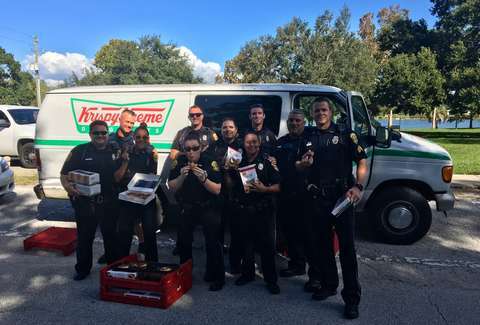 Possibly as a reward for their good deed, possibly adhering to health codes, the store manager reportedly gifted all the donuts to the officers. The officers then gave them to an event for feeding the homeless that was happening next door to their station. But first, they ate a few themselves. Who among us could resist?